Chaat lovers, Shreeji’s – The Fusion Kitchen at Borivali doles out some of the best fusion chaat we’ve ever tasted. Shreeji’s has become a household name for chaat, especially fusion chaat in the area. One of the best in the business and the first of its kind in Mumbai, we have enjoyed ourselves thoroughly whenever we have come here. Even though this is a roadside stall, the hygiene levels are top-notch and the food is oh-so-satisfying! Since this falls under the category of street food, the ambiance really doesn’t come into the picture, but like the wise men say, ‘Don’t judge a book by its cover’. The Veg Extravaganza and The Pizza Punch served here must definitely be tried. There’s no point getting your car here because parking can be an issue since there is no dedicated space given to it. 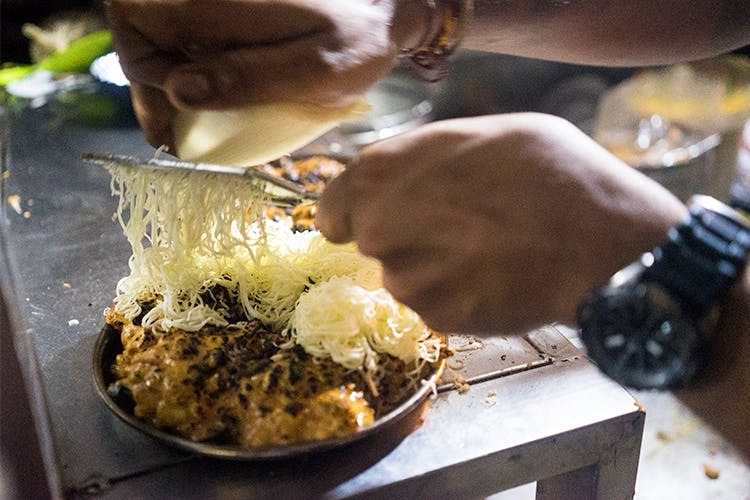 There’s nothing some cheese and chaat can't sort out, and at Shreeji’s you can get both in abundance.